This route was on my mind since last year. 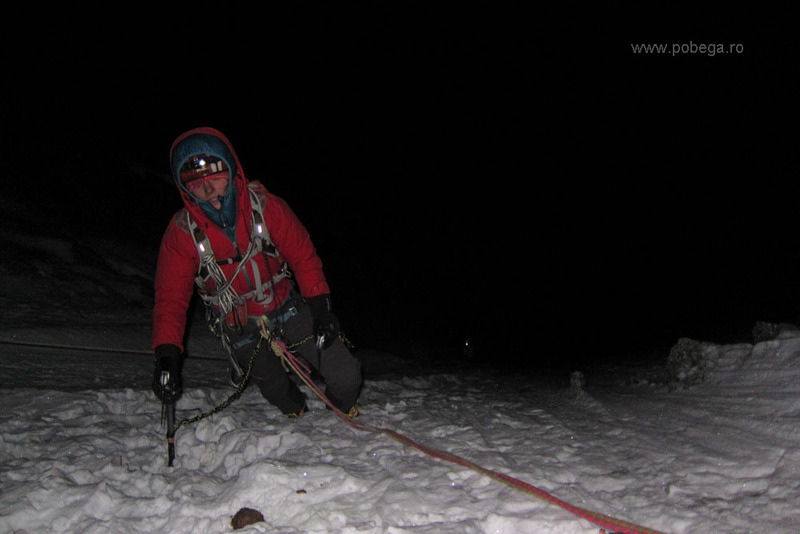 I received precious information from Mihai Sima and Sorin Nichiforiuc (romanian team) after they climbed it back in March 2011. Thank you! 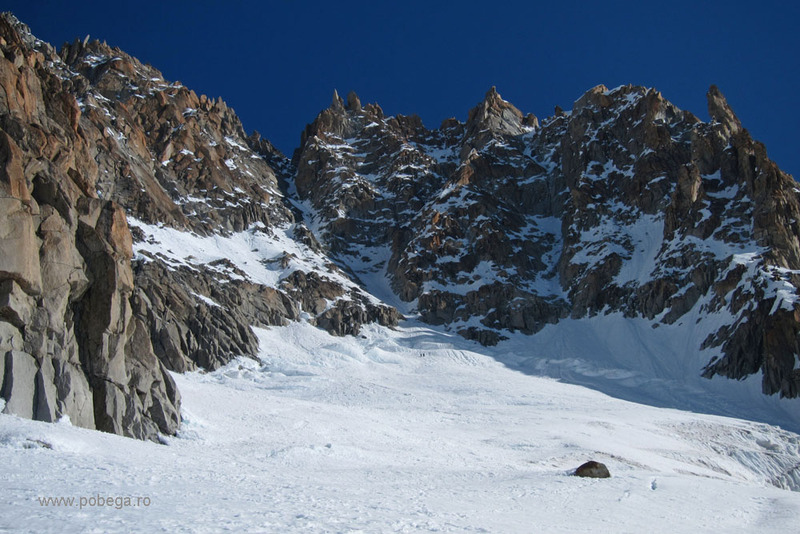 We arrived in Chamonix Saturday night (24 March 2012) and phoned to make a reservation at ref Argentiere (the start for Ginat). But everything was booked till Tuesday. Reason? Piolet d’Or Festival and ski season. So, we decided to see how are the conditions in “Linceul” in Grandes Jorasses N face (link). We slept one night at Leschaux refuge, but as the altitude is only 2431 m there, we didn’t make our acclimatization for Ginat (4000 m). 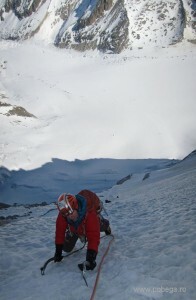 Tuesday (27 March) we stepped for the first time on Grands Montet summit (3233 m) surrounded by many skiers. First time for us in this area, and we enjoyed the view. 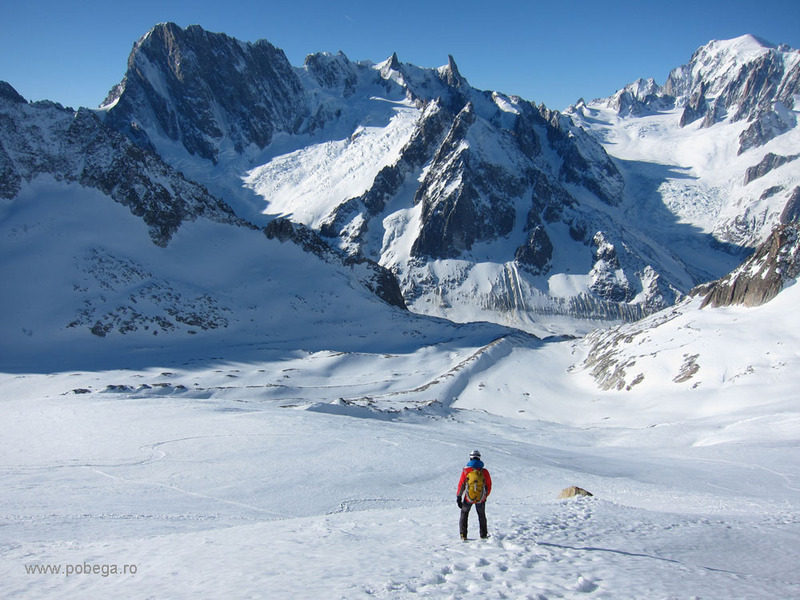 Going down from here, you cross Rognon glacier to Argentière glacier and on the right you can see Les Droites. Here is the spot where we’ve tried to observe and read our route, especially the start of it, as we had to climb it next day in the dark. 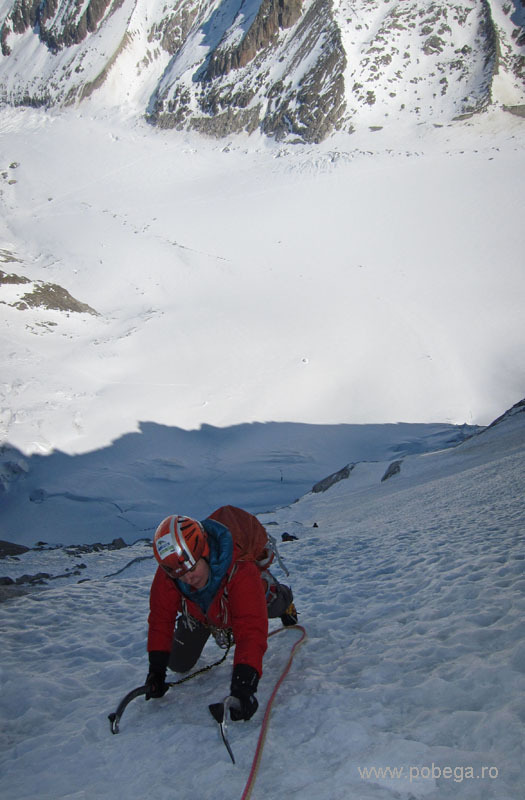 Silvia is studying the line from Argeniere refuge. Ginat route drawn in red color. Next day, we woke up at 2 am and left the refuge at around 2:30 am. Dani Arnold with his partner were on their skis in front going very fast and we tried to keep up with the UK team. They were on rackets. We were by foot, so we had to make effort to keep up with them. 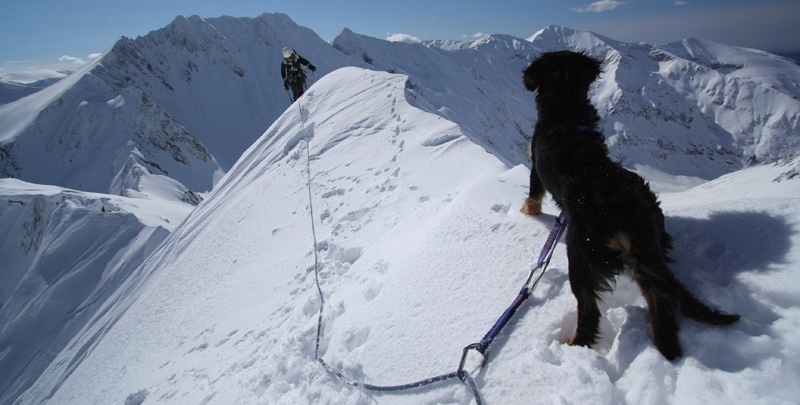 At around 4:00 we got on the base of the route and Silvia was very keen to start climbing it. After the first pitch, one team decided to retreat (it was a french guide with a girl I assume). The swiss team was way in the front. Next to us we had Wilki and Finn from UK. 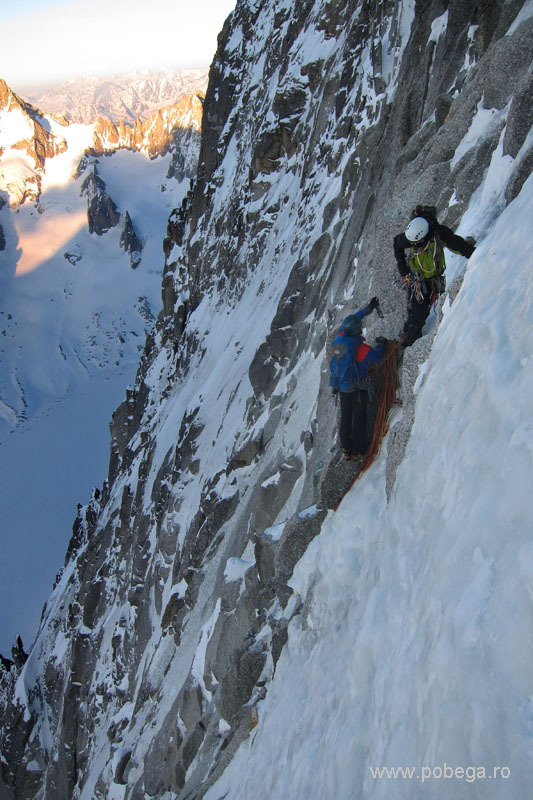 They have climbed with the same speed and belayed at the same spots where we belayed. It was nice to dialogue and share the same enthusiasm with them. 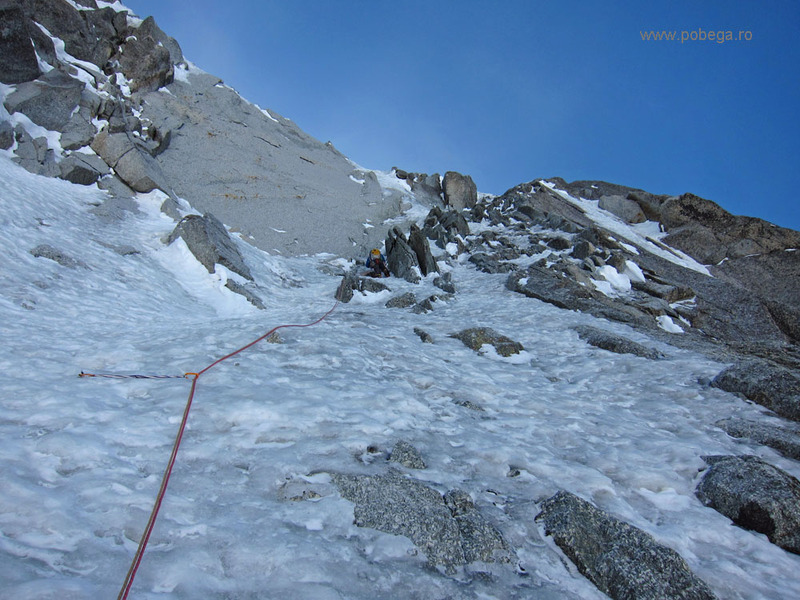 When it was my turn I had a small mixed pitch (easy) followed by tough ice (15-20 m) which I didn’t like. 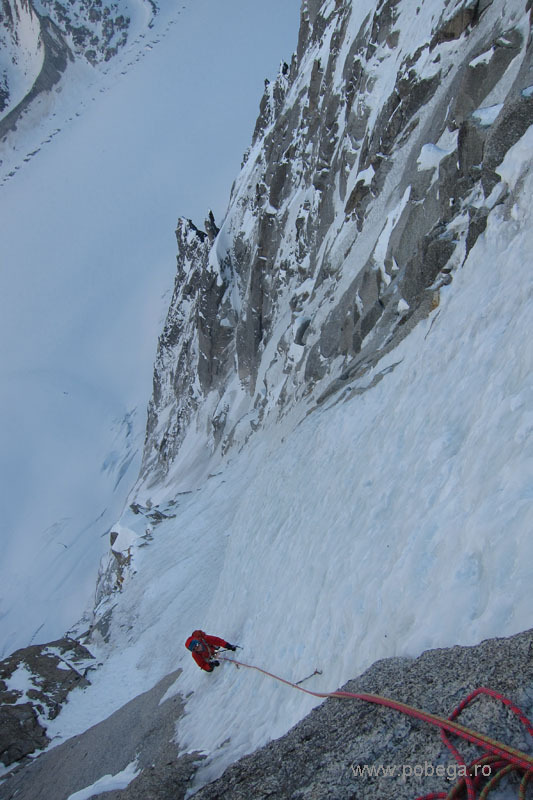 After that, we made a left traverse and found good ice all the way up trough the big ice slope situated in the middle of the wall. 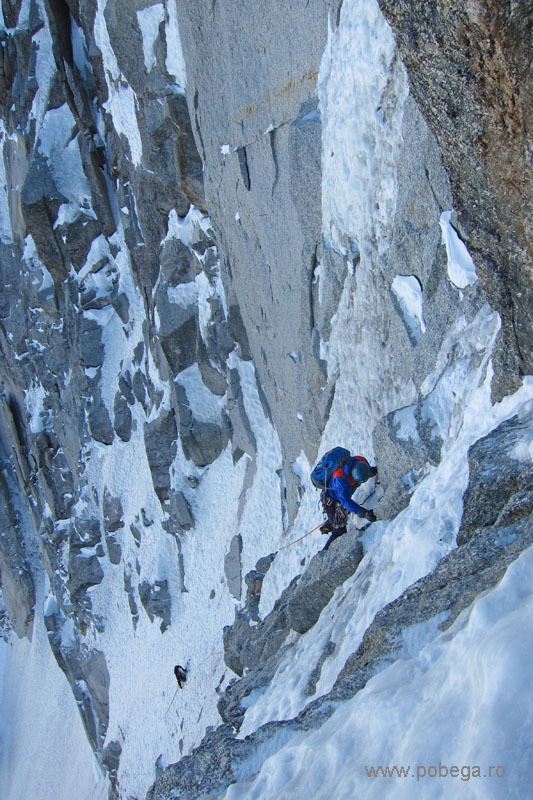 On this section we simul-climbed. 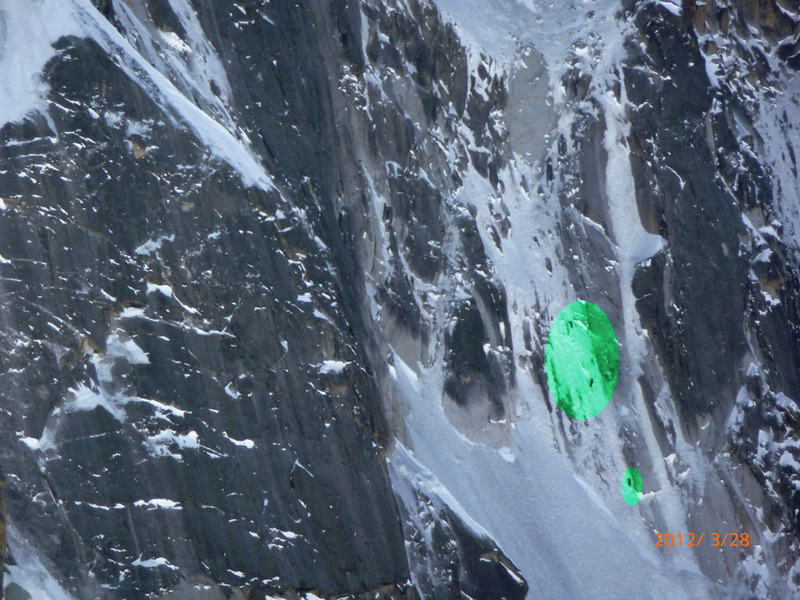 Below is a picture with us in the route (green spots). 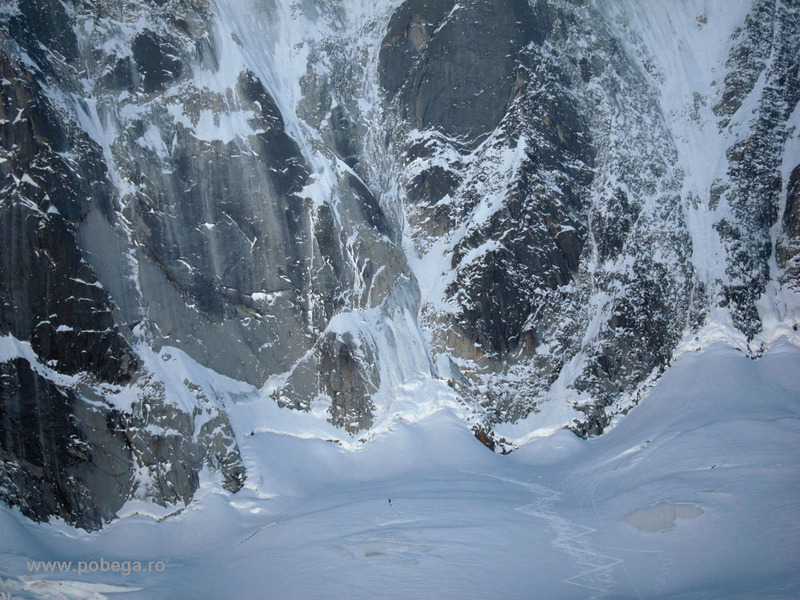 Sorin Nichiforiuc did this photo from refuge Argentiere, where he was at that moment. Thanks! 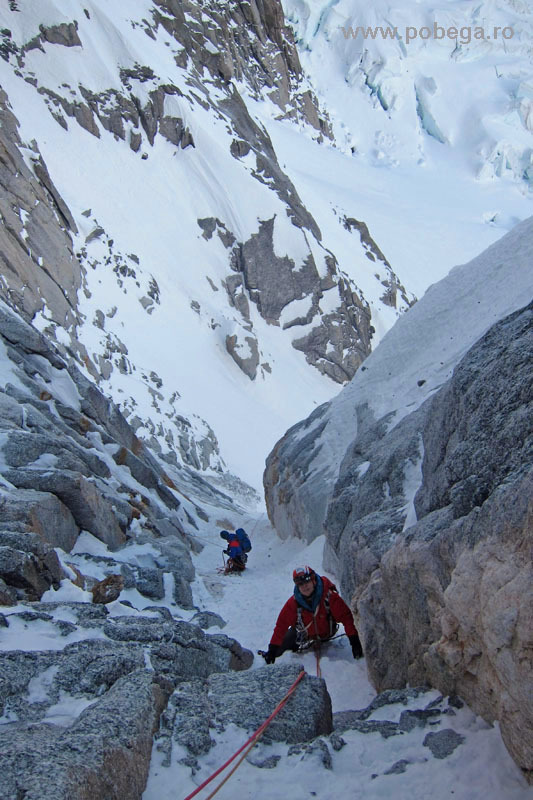 As we climbed higher and we were not acclimatized, soon we began to feel the effort. 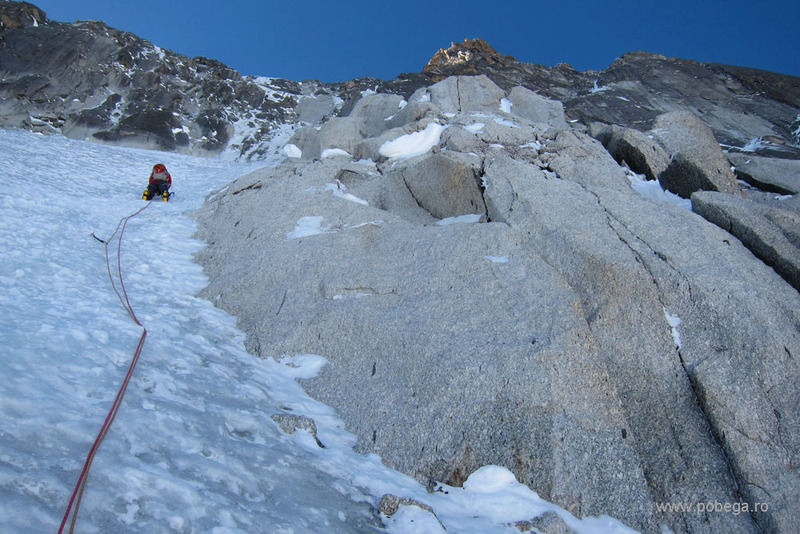 The route is long (1000m) and we felt our calves burning. Not difficult, but long. Finn and Wilki did some great photos. 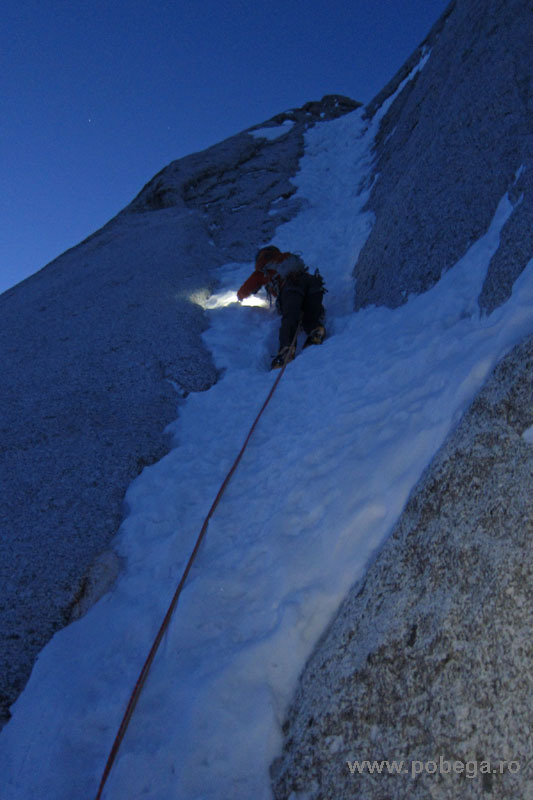 Below is an examples that shows Silvia climbing and the exposure of the route. 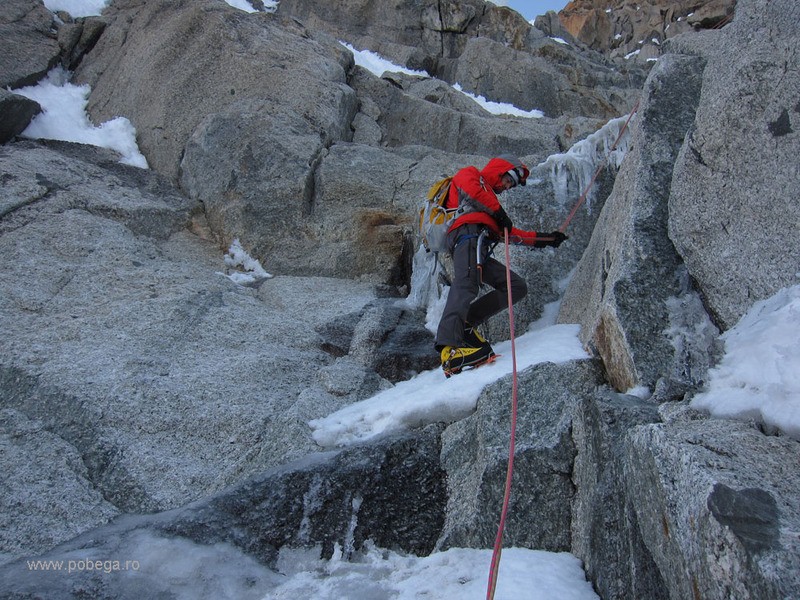 Once the big ice field was climbed, I’ve faced a mixed pitch (80°) traversing right. 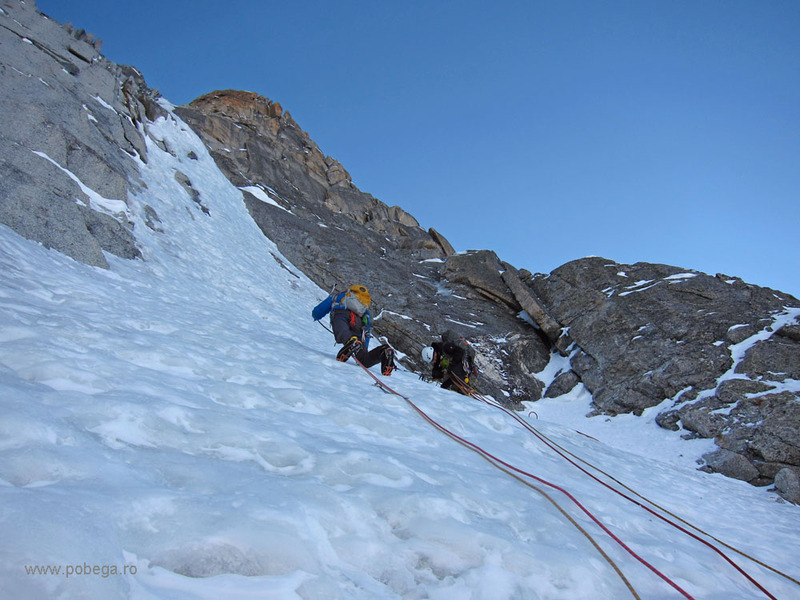 Wilki and Finn climbing the mixed pitch. 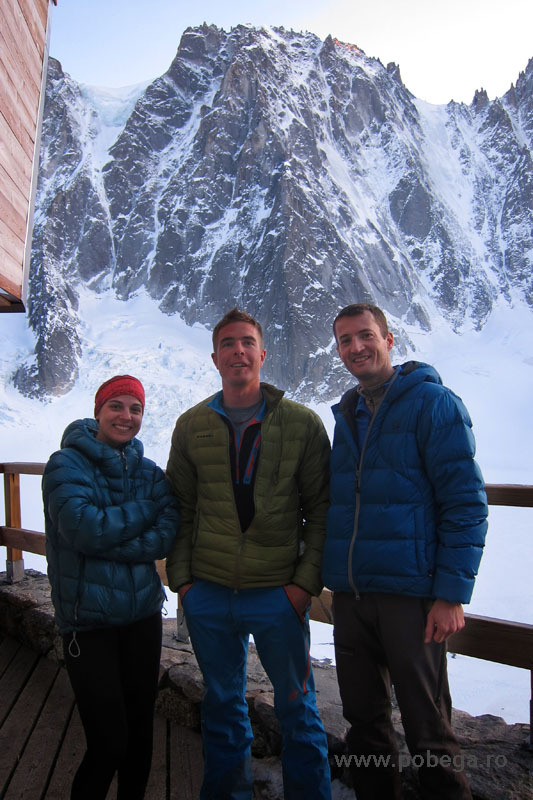 It was getting late, but we were very excited about the view we had towards Argentiere Glacier. At some point (about sunset), it was breathtaking. Another maybe 2 pitches and the slope got steep again. As the light goes down, we shot the last pictures. 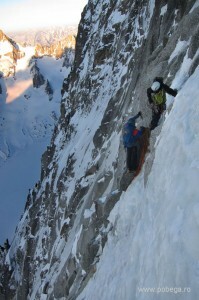 Silvia exiting in the notch (Breche) of Les Droites. It was midnight already. Finn and Wilki decided to have a brew stop and to take a nap on the ledge there (they had their bivy bags). They planned to start to rappel on the Southern side in the morning. We also had a brew stop, I love my Jetboil! Hot tea and some warm tomato soup. It was cold and our Emergency blanket didn’t work as it was also windy. 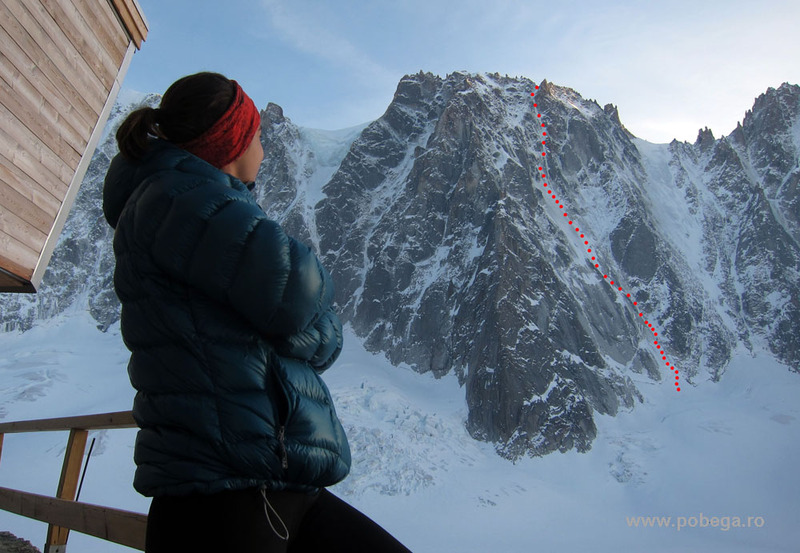 So, we started rappeling on the Southern side (towards Couvercle hut) at 3:30 am and by the time we got down on the glacier it was morning already and we could see the path very clearly. 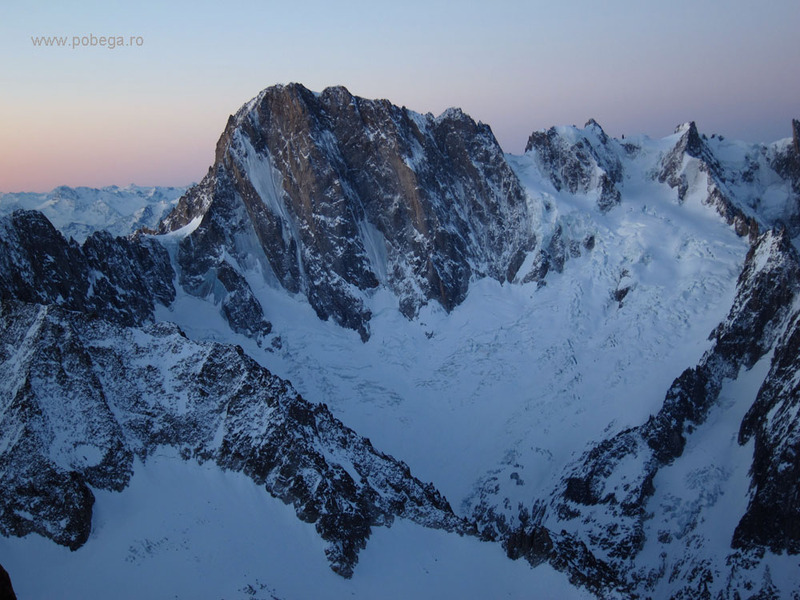 A feeling of “Déjà Vu” came to me when I saw Grandes Jorasses N face early in the morning. Up there in the notch is where we’ve been last night. Though we were tired, we didn’t stop at Couvercle refuge. 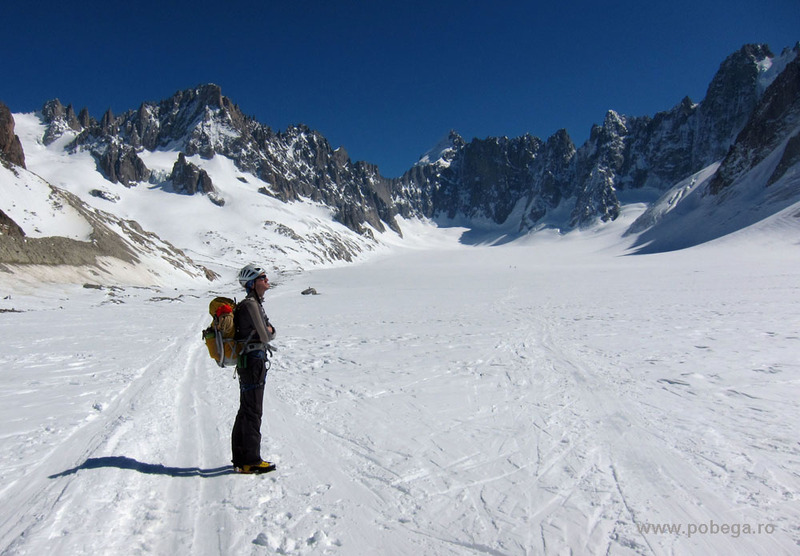 We’ve spend some time to warm in the sun and than went down to Mer du Glace glacier. I love this picture that Silvia did. Although it’s refer as an entirely ice route in the guide book, in the last years this is not real anymore. 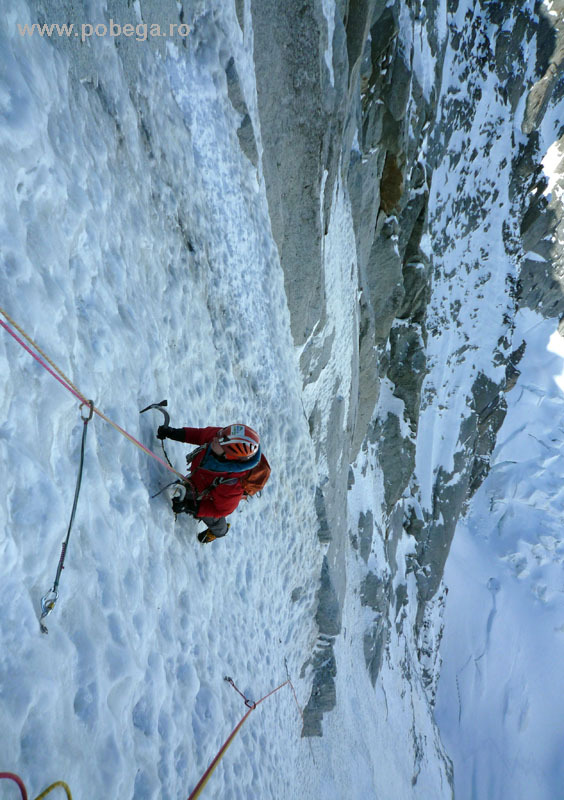 There are 2 mixed pitches in the route, not dificult (made our climb more interesting and fun). 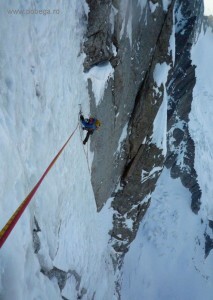 The first one is right after passing the bergschrund followed by a 15 m of horrible black ice. You will be climbing this in the dark! 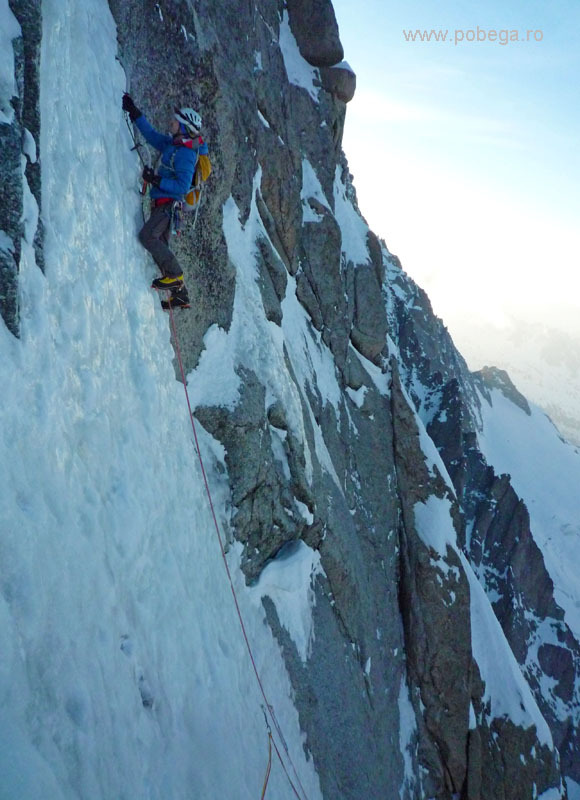 The last mixed pitch (30 m maybe) is after the big ice slope, when making the traverse to the right (in our film, minute 5:48). We found a peg (piton) there. We used some nuts for protection also. 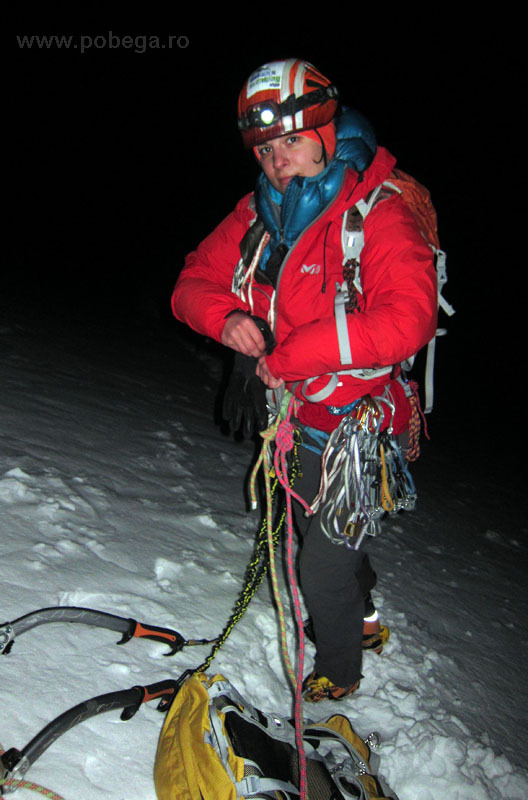 2 half ropes Beal Iceline, 50 m (this length is ok for the descend by rappelling on the Southern side too), 8 ice screws, 10 quickdraws, a set of nuts (we use medium and big size mostly), 4 cams (used maybe 2, small size), 2 long slings for belay. 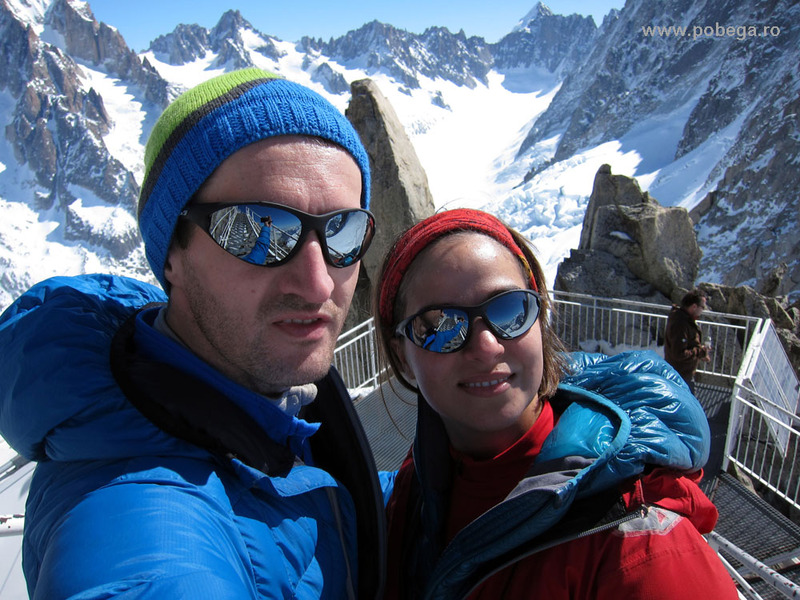 We had our Jetboil (stove) with us and 1.5 l water for each during the climb. Bear in mind the face is 1000 m high. 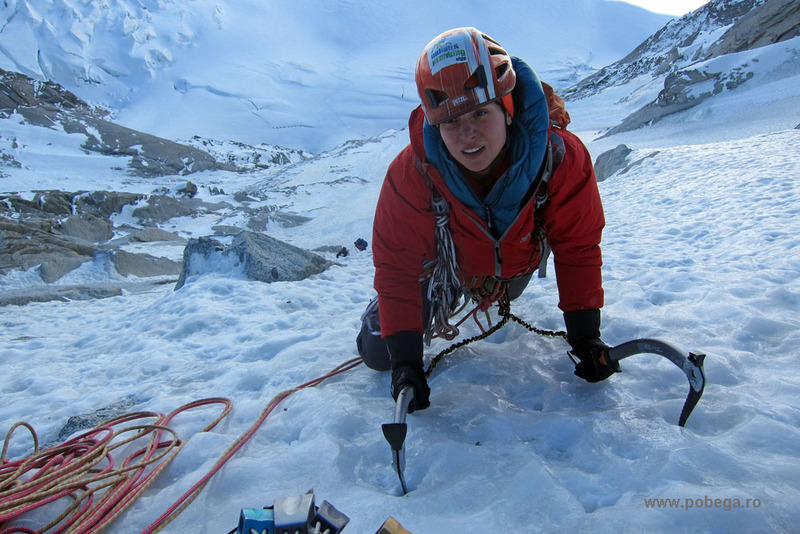 You can find Silvia’s article about Ginat here. Absolutely great video! What s this black ice you were talking about? Alex, according to weather conditions, ice can be soft, hard, brittle or tough. The ice I refearred as “black ice” is this “tough ice” that is hard to penetrate with your tools. It’s not truly black, it is virtually transparent. Anyway, it looks black when you look at it from a distance. Thanks for your comment! 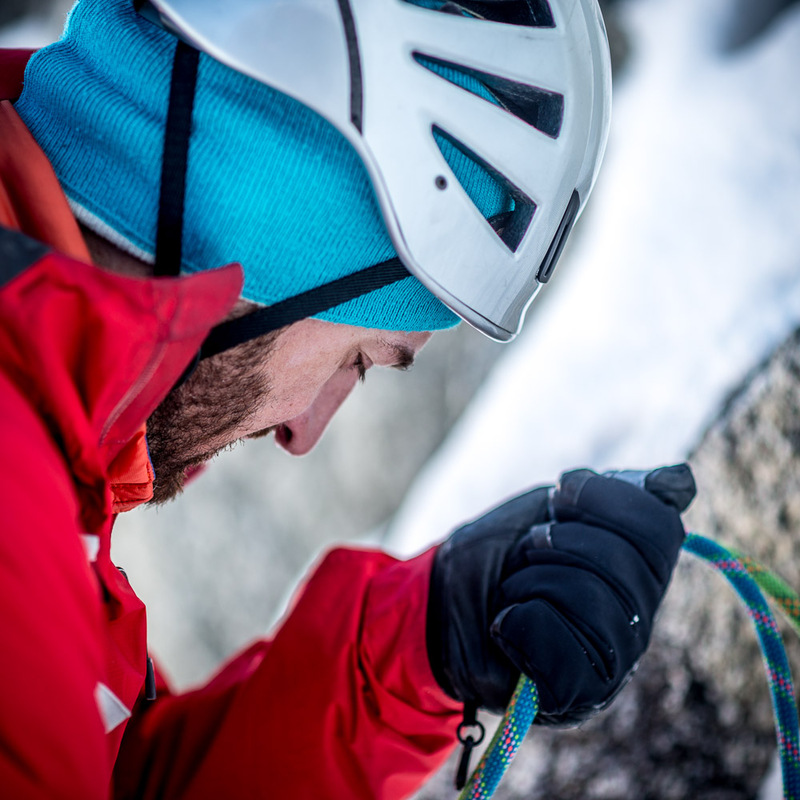 Thanks for sharing your climbing experience. Motivating in deed!